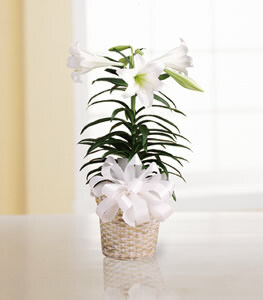 This lovely white Easter lily is trimmed with a lavender satin bow. A traditional gift for the spring season, it also makes a wonderful hostess gift for Easter celebrations. Ive enjoyed your service many times, and have grown to expect outstanding service, but you even surpassed yourselves on Valentines Day. Its a pleasure doing business with a firm that keeps its promises again and again without fail and delivers its service and product on time and with outstanding quality. I look forward to using your service again and again. Good job.